Apple has released watchOS 4.1, adding music streaming on the Apple Watch Series 3 and a brand new Radio app. The update, pushed out today alongside iOS 11.1, delivers one of the headline features promised for the latest Apple smartwatch back when it was announced in September: the ability to play more than just locally-cached music. Meanwhile, there are also improvements to how the Apple Watch can track your exercise. Until now, though the Apple Watch offers standalone music playback to a set of Bluetooth headphones, that’s been fairly limited. Music had to be loaded directly to the watch while it was charging, over WiFi, with users pre-selecting what playlists they thought they might want to hear. The wearable could also create a custom playlist based on the most frequently played music, though again it needed to be loaded in advance. Now, that limitation has been lifted. The Apple Watch can stream tracks from a user’s iCloud Music Library over WiFi or, if they’re wearing an Apple Watch Series 3 LTE edition, over the cellular network. There’s also support for Apple Music streaming, if you’re a subscriber. Wearers can use Siri to find songs, albums, and playlists. If you’re not yet signed up, there’s still a streaming music option. 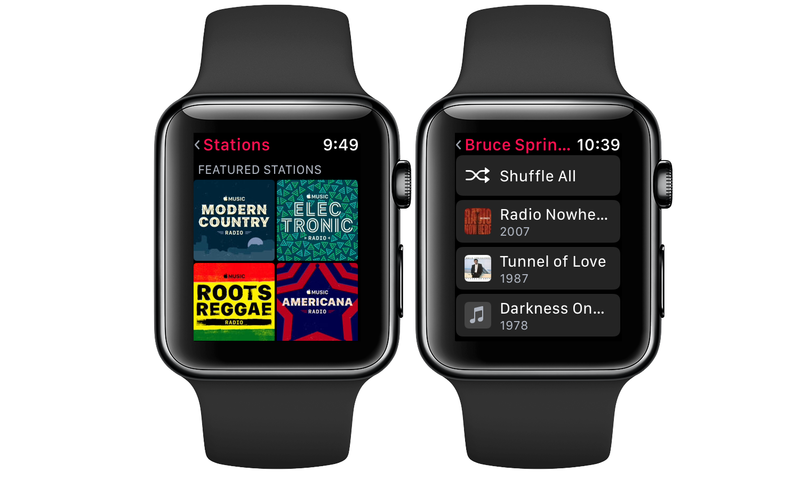 Apple has added a new Radio app to the Apple Watch in watchOS 4.1, which supports its own custom and curated stations like Beats 1. However, for the moment if you’re a subscriber to another streaming music service there’s still no wireless support. 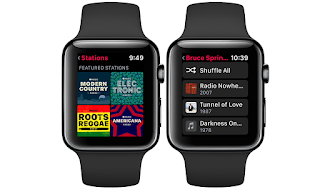 That’s something users of Spotify, Pandora, and other platforms have been asking for repeatedly, and we’re hoping to see Apple Watch apps for them sooner rather than later. Elsewhere, there’s now support for GymKit, Apple’s new platform for professional exercise equipment. If the treadmill, elliptical, stair stepper, or indoor bike supports it, they’ll be able to sync directly to the Apple Watch. That includes distance, pace, and energy burn information, which Apple says should be more accurate than the watch alone can track. As with iOS 11.1, the other improvements are generally bugfixes and ironing out glitches. There’s now the ability to disconnect from a WiFi network in the Apple Watch Series 3 LTE’s Control Center, while missing haptic feedback some users were encountering for silent alarms have also been restored. Some wearers were finding their smartwatch wasn’t reminding them to stand up, which has been fixed, as has a charging problem from the 1st generation Apple Watch. You can download watchOS 4.1 through the Apple Watch companion app on the iPhone. 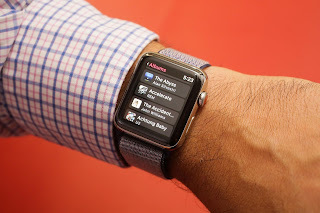 Your watch will need to be on its charger and the battery at at least 50-percent in order to install.